The young mother started getting advice early on from friends in the close-knit Somali immigrant community here. Don't let your children get the vaccine for measles, mumps and rubella — it causes autism, they said. Suaado Salah listened. And this spring, her 3-year-old boy and 18-month-old girl contracted measles in Minnesota's largest outbreak of the highly infectious and potentially deadly disease in nearly three decades. Her daughter, who had a rash, high fever and a cough, was hospitalized for four nights and needed intravenous fluids and oxygen. "I thought: 'I'm in America. I thought I'm in a safe place and my kids will never get sick in that disease,' " said Salah, 26, who has lived in Minnesota for more than a decade. Growing up in Somalia, she'd had measles as a child. A sister died of the disease at age 3. 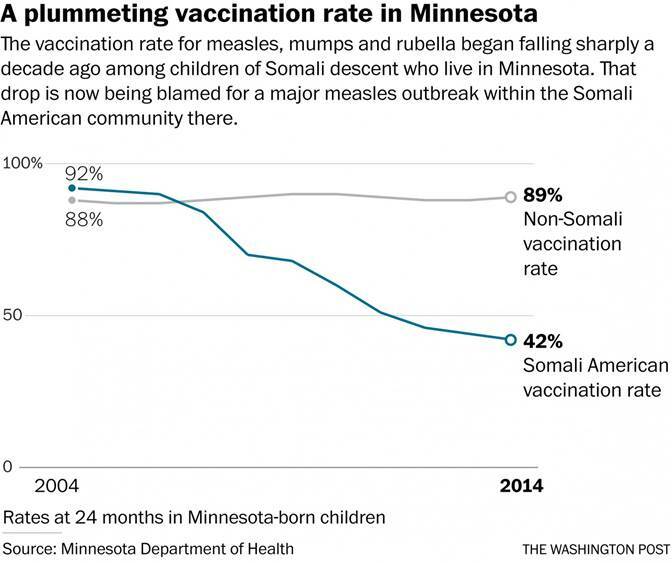 Salah no longer believes that the MMR vaccine triggers autism, a discredited theory that spread rapidly through the local Somali community, fanned by meetings organized by anti-vaccine groups. The advocates repeatedly invited Andrew Wakefield, the founder of the modern anti-vaccine movement, to talk to worried parents. Immunization rates plummeted and, last month, the first cases of measles appeared. Soon, there was a full-blown outbreak, one of the starkest consequences of an intensifying anti-vaccine movement in the United States and around the world that has gained traction in part by targeting specific communities. "It's remarkable to come in and talk to a population that's vulnerable and marginalized and who doesn't necessarily have the capacity for advocacy for themselves, and to take advantage of that," said Siman Nuurali, a Somali American clinician who coordinates the care of medically complex patients at Children's Hospitals and Clinics of Minnesota. "It's abhorrent." Although extensive research has disproved any relationship between vaccines and autism, the fear has become entrenched in the community. "I don't know if we will be able to dig out on our own," Nuurali said. Anti-vaccine advocates defend their position and their role, saying they merely provided information to parents. "The Somalis had decided themselves that they were particularly concerned," Wakefield said last week. "I was responding to that." He maintained that he bears no fault for what is now happening within the community: "I don't feel responsible at all." 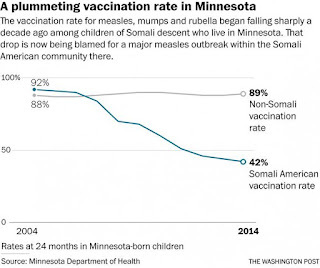 How measles outbreaks happen in the U.S.
MMR vaccination rates among U.S.-born children of Somali descent used to be higher than among other children in Minnesota. But the rates plummeted from 92 percent in 2004 to 42 percent in 2014, state health department data shows, well below the 92-94 percent threshold needed to protect a community against measles. Wakefield, a British activist who now lives in Texas, visited Minneapolis at least three times in 2010 and 2011 to meet privately with Somali parents of autistic children, according to local anti-vaccine advocates. Wakefield's prominence stems from a 1998 study he authored, which claimed to show a link between the vaccine and autism. The study was later identified as fraudulent and was retracted by the medical journal that published it, and his medical license was revoked. The current outbreak was identified in early April. As of Thursday, there were 41 cases, all but two occurring in people who were not vaccinated, and all but one in children 10 and younger. Nearly all have been from the Somali American community in Hennepin County. A fourth of the patients have been hospitalized. Because of the dangerously low vaccination rates and the disease's extreme infectiousness, more cases are expected in the weeks ahead. Federal guidelines typically recommend that children get the first vaccine dose at 12 to 15 months of age and the second when they are 4 to 6 years old. The combination is 97 percent effective in preventing the viral disease, which can cause pneumonia, brain swelling, deafness and, in rare instances, death. Minnesota's Somali community is the largest in the country. The roots of the outbreak there date to 2008, when parents raised concerns that their children were disproportionately affected by autism spectrum disorder. A limited survey by the state health department the following year found an unexpectedly high number of Somali children in a preschool autism program. But a University of Minnesota study found that Somali children were about as likely as white children to be identified with autism, although they were more likely to have intellectual disabilities. As parents sought to learn more about the disorder, they came across websites of anti-vaccine groups. And activists from those groups started showing up at community health meetings and distributing pamphlets, recalled Lynn Bahta, a longtime state health department nurse who has worked with Somali nurses to counter MMR vaccine resistance within the community. Fear of autism runs so deep in the Somali community that parents whose children have recently come down with measles insist that measles preferable to risking autism. One father, who did not want his family identified to protect their privacy, sat helplessly by his daughter's bed at Children's Minnesota hospital last week as she struggled to breathe during coughing fits. The 23-month-old was on an IV for fluids and had repeatedly pulled out the oxygen tube in her nose. Her older brother, almost 4, endured a milder bout. Neither had received the MMR vaccine. The children now have antibodies to protect against measles, but they still need the vaccine to prevent mumps and rubella. Their father, who is 33 and studying mechanical engineering while working as a mechanic, wants to wait. His worry: autism. A colleague has a son "who is mute." "I would hold off until she's 3 . . . or until she fluently starts talking," he explained. His wife no longer harbors doubts, however. As soon as both children are well, she said, "they are going to get the shot." The pervasive mistrust was evident Sunday night during a meeting, sponsored by several anti-vaccine groups, that drew a mostly Somali crowd of 90 to a Somali-owned restaurant here. Patti Carroll, a member of the Vaccine Safety Council of Minnesota, described its goal as giving parents more information, including their right to refuse to vaccinate. People have been "bullied big time" by doctors and public health officials, she said. The presentation by anti-vaccine activist Mark Blaxill drew cheers and applause. Blaxill, a Boston businessman whose adult daughter has autism, played down the threat of measles and played up local autism rates. "When you hear people from the state public health department saying there is no risk, that [vaccines] are safe, this is the sort of thing that should cause you to be skeptical," Blaxill said. "I am very concerned, especially in the midst of a measles outbreak, to have folks come into a community impacted by this disease and start talking about links between MMR and autism," said Andrew Kiragu, interim chief of pediatrics at Hennepin Medical Center in Minneapolis. "This is a travesty." He and the other doctors were interrupted by boos and yelling. "For God's sake, I want to know if vaccines are safe," Sahra Osman shouted. She has a nearly adult son who received an autism diagnosis when he was 3. "My people are suffering! We're not ignorant. I read a lot. I know a lot. I educate myself. . . . You don't know what you are talking about." While scores of studies from around the world have shown conclusively that vaccines do not cause autism, that is often not a satisfactory answer for Somali American parents. They say that if science can explain that vaccines don't cause autism, science should be able to say what does. But researchers don't really know. A growing body of evidence suggests that brain differences associated with autism may be found early in infancy — well before children receive most vaccines. Other studies have found that alterations in brain-cell development related to autism may occur before birth. There are some genetic risk factors for autism, and advanced parental age has been associated with the condition. Meanwhile, the ongoing spread of the anti-vaccine message is making it harder to control the burgeoning number of measles cases. The groups continue advising parents, "in the middle of their crisis," on how to opt out of vaccines, said pediatric nurse practitioner Patsy Stinchfield, an infection-control expert leading the outbreak response at Children's Minnesota. That message is "exactly the opposite of what clinicians and public health officials are urging, which is to get vaccinated as soon as possible." Staffers at her hospital have been working around the clock to vaccinate hundreds of people who may have been exposed; an MMR dose given within 72 hours of exposure can prevent measles. When their two sick children are well, Suaado Salah and her husband, Tahlil Wehlie, plan to talk to friends and acquaintances to spread the word that the anti-vaccine groups are wrong and that all youngsters should get immunized. "Because when the kids get sick, it's going to affect everybody. It's not going to affect only the family who have the sick kid," she said. "They make sick for everybody. That's when you wake up and say, 'Okay, what happened?' " But she understands the apprehension that fed the outbreak. With a parent whose child has autism, she said, "It's something that you're looking for an answer for how it happened and what happened to your kid."